Needing a dental implant is rough enough for the patient without having to worry about paying for it. However, cost is a necessary concern. Depending on the amount of work to be done, dental implants can cost anywhere from just shy of $1,000 to just shy of $100,000. What is important for the patient in need of the implant is that he thoroughly researches the cost of various types of implants at multiple dental locations to determine which is most practical for his needs. If only a single implant is needed, the typical cost is roughly $900 to $3,000. However, if other procedures such as extractions, tissue grafts, or bone grafts are necessary for the implant surgery, that cost can increase by several hundred or several thousand dollars. In order to properly insert the implant, an abutment or metal extension is attached to it, after which the bridge or crown is connected to the abutment. The patient may also need a temporary tooth, called a “flipper tooth”, while the mouth heals after the implant surgery. Each of these separate steps for dental implants adds additional cost to the implant, from several hundred on up to several thousand. Therefore, a patient in need of a single dental implant can expect to pay anywhere from approximately $1,500 on up to $10,000 in total. In the event of multiple implants due to tooth decay, an unfortunate accident, or another reason, the cost increases. 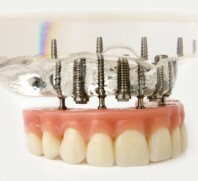 If the implants are to be placed next to each other in the mouth and therefore only one bridge is needed to connect them, it is less expensive than having multiple single implants to be inserted in various places in the mouth. Prices range from $4,000 on up to $40,000 or more for multiple tooth implants and bridges. The expense varies according to the type of implant (for example, mini dental implants cost less) and denture materials needed, as well as any other procedures that need to be conducted. For a full set of both lower and upper dental implants and dentures, the cost can be as high as $96,000, though the average is generally closer to $30,000. Insurance coverage varies. Many insurance companies consider implants to be cosmetic procedures and therefore do not cover them. However, some dental insurances or even health insurances can cover some of the cost so that the patient does not have to front the expense entirely out of pocket. As mentioned above, along with the cost of the implants themselves, there are other expenses to be considered. First of all, the different steps required in implant surgery are usually performed by different people. Periodontists, oral surgeons, or dentists with higher specialized training can perform implant surgery while abutments, bridges, crowns, or dentures, on the other hand, are put into place by either a prosthodontist or a dentist. For treatment by multiple professionals in the field, the expense can increase. Each of the additional products (abutment, crown, flipper tooth, etc. ) also increases the cost of the entire implant procedure. Beside the financial cost of dental implants, there are also non-financial costs associated with this dental treatment. Most specifically, the area where the implant is placed requires time to heal after surgery. Dentists usually allow the implant site to heal for a period of three to six months after the surgery has been conducted, during which a flipper tooth may be used. The entire process can take up to a year from the initial procedure until the time that the mouth has fully healed. Above all, when investigating the cost of dental implants, make sure to factor in the cost of the additional required pieces such as abutment and bridge. Sometimes an individual can find discounted prices on implant surgery such as those offered by dental school clinics. For treatment by supervised students or faculty members, the cost can be more affordable. Insurances who offer partial coverage will typically provide for the patient a list of approved dentists, periodontists, or prosthodontists whom they recommend for the treatment. The above listings are national averages and rates rather than location specific. For more appropriate estimates for the cost of dental implants for you depending on your insurance coverage and location, contact your insurance company and the dental facilities in your area or search for local specialists who are part of the American Dental Association, American Academy of Implant Dentistry, or other relevant organizations.